Nicola Lipman as Don Corleone. Photo by Ron Reed. This is the first time in about 40 years that I have seen an all-woman troupe perform drama. Strangely enough, then it was Shakespeare’s Hamlet, performed to music by the Takarazuka Revue in Tokyo. (They’re still going after almost 100 years.) We had tickets at the very back of a large theatre, and I didn’t understand much. At any rate, Classic Chic’s rendition of Corleone: The Shakespearean Godfather, written by David Mann, was far more both enjoyable and moving: 1) The language was accessible 2) Pacific Theatre has an intimate venue and 3) I’ve read a lot of Shakespeare in the meantime, lived a while, and understand tragedy better. If you like Shakespeare, you have got to see this play. It’s a little crazy-making, trying to figure out which of the Bard’s plays many of the half-lines are from, but great fun. I recognized four or five plays, and afterwards my daughter Katherine and Debra Sears filled me in on some I had missed. 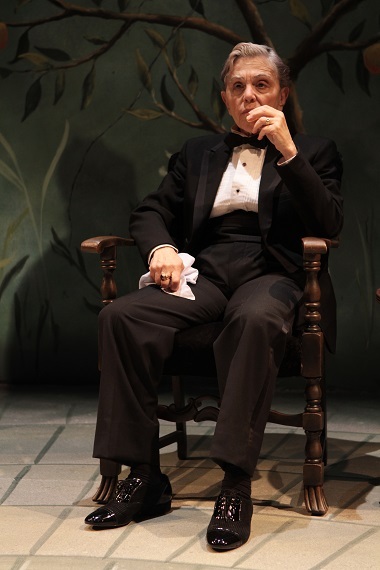 The Godfather and his son Michael’s grasping of power for prestige, money­­­­ and, finally, revenge suit Shakespeare’s tragic genre – and iambic pentameter gave this retelling of The Godfather an added depth of humour, pathos and horror. Like Shakespeare, David Mann has peppered the tragedy with comedy. There were so many wonderful aspects to this delightful, sad play. Heidi Wilkinson’s set design of a gracious Italian garden patio works for both scenes set in New York and Italy. The fight scene – somehow horrifying (because it involved women?) – directed by Josh Reynolds was graphic and intense. The play is worth watching for Nicola Lipman’s portrayal of Vito Corleone (the Godfather) alone. Her quiet, understated strength and carriage are beyond remarkable. 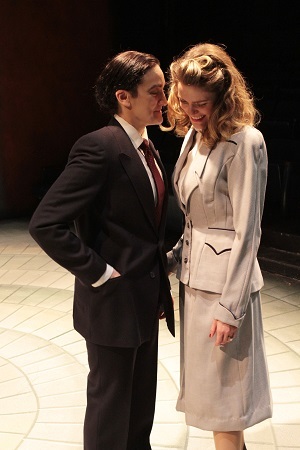 Stefania Indelicato as Michael and Kaitlin Williams as Kay. Photo by Ron Reed. Stefania Indelicato portrays Michael as a reserved character suddenly galvanized into action because of an act of treachery against his father and brother. He is motivated by revenge. Michael’s cold insistence that his fiancé, Kay (Kaitlin Williams, who has been a regular with Pacific Theatre and will be appearing in Bard on the Beach this coming season), leave the “business” to him, reveals him to be maybe even more ruthless than his father. They begin to wonder whether, if they kill him, they might themselves be liable to hellfire. So, they approach the priest for counsel on their intended murder. Upon being advised to repent, they come to themselves, and run away without completing their mission! The most chilling juxtaposition occurs when the “family” commits itself to a Christian life at the baptism of the Godfather’s grandchild, just as the Godfather has ordered the murders of the heads of the other crime families. In powerful irony, Lipman takes on the role of the baptizing priest in this scene. Most, if not all the actors play two or more characters in the course of the play. I also loved Christina Wells Campbell’s speech, modeled on Peter Quince’s garbled speech to Theseus in A Midsummer Night’s Dream­. The Godfather, like Theseus, recognizes good will even in the midst of complete language incompetence. In trying to move the family away from crime, the Godfather doesn’t want his youngest son to take over the Don’s mantle; he wants him to be free, to have a normal life. The Godfather has even attempted to broker a peace. So, the climactic tragedy comes when Michael does become the new head of the family, perpetuating violence in the newly-adopted drug trade. The turnabout of gender roles is particularly interesting. In Japan, women were the first performers. As in England, they were barred from the stage when young noblemen began losing their heads over them. It is satisfying to see women getting to take on “meaty” roles, and particularly when they do them so well. Three Pacific Theatre apprentices are taking part in the production; it seems to be mutually advantageous collaboration between Pacific Theatre and Classic Chic. ← Around Town: Women’s Memorial March, Festival Prayer, Smoking Rock . . .